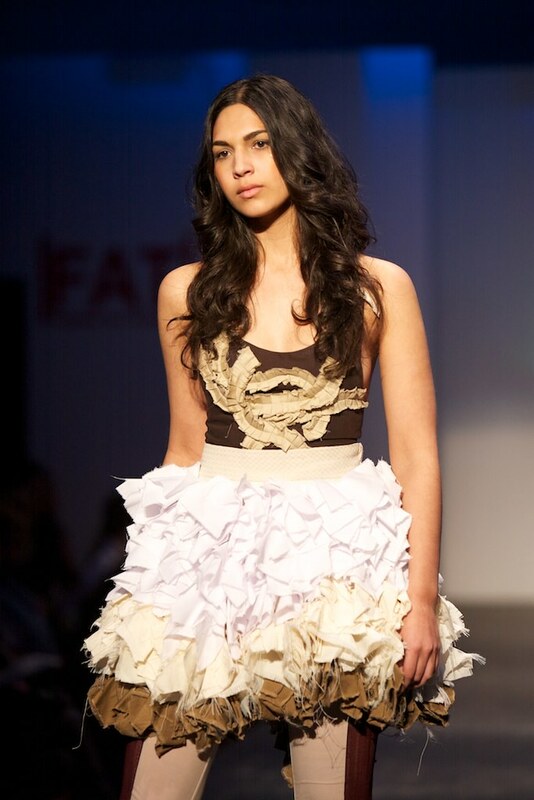 Day 2 of |FAT| brought the theme of "Natural Occurrences" where designers showcased their eco-friendly fashions. The show began with a message from Fashion Takes Action, an organization that helps fashion businesses become sustainable through the promotion of eco-friendly organic materials. The concept of "slow fashion" was promoted. Slow fashion strays away from the typical fast production and focuses on taking time to make quality garments. Likewise, people should be taking time to think about what they buy. Timeless pieces that can be re-worn promote sustainability by reusing clothes. 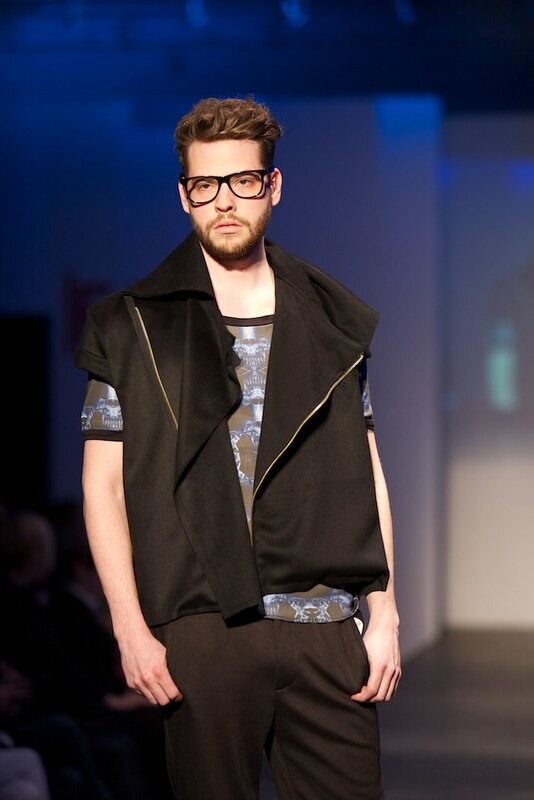 The show opened with Loft 604 and its line of menswear. This relaxed preppy look featured cable knit cardigans, nautical capris, and a double-breasted peacoats. This portion of the collection was quite reminiscent of styles that I might see at Jcrew. The line also featured a more rugged look with men in work boots. Jool drew on 80s/90s grunge trends with destroyed denim, fringes, and neon yellow armbands that could have been scrunchies. The collection also featured outfits with platform heels and bright purple leggings. Kali used relaxed fabrics in minimalist fashions. The collection drew on current trends such as maxi dresses and wide brimmed hats. The styles here resembled items that could be found at American Apparel. 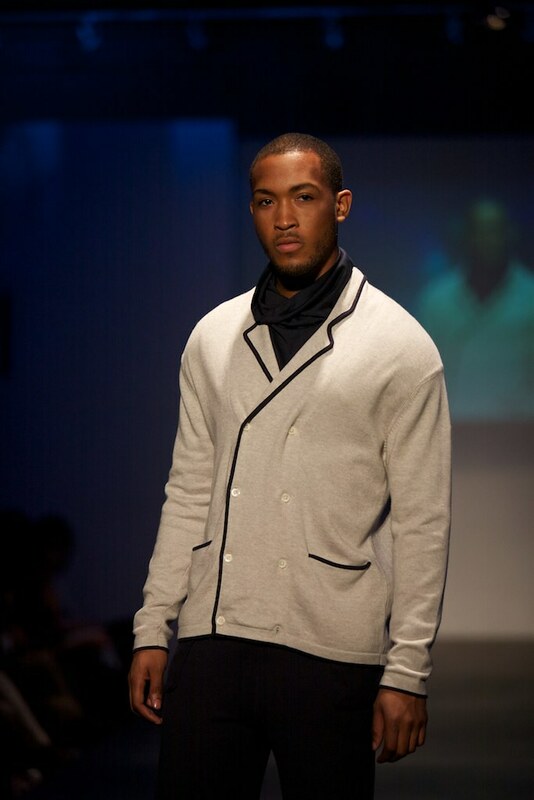 David C. Wigley showed next with his brand, Worth. His collection was opened by a ballerina in a black tutu wearing animal-like face paint. She set the tone for this intense, almost gothic collection. This collection featured both men's and women's fashion. Some men wore harnesses with jeans, where women wore black and blue print over dropped-crotch pants. The second set began with Moon Burn who used models and looks I would like to describe as "polished cavemen". This menswear line not only brought goggles as head accessories, vertically striped pants, and eclectic patterns, but it also brought a performance. Two models came down the runway twirling batons and ropes, and two others had a light saber fight in the middle of the runway. Nettie Blanche offered a simple, polished look with an autumn palette of burgundy, rusty orange, forest green, and deep blue. 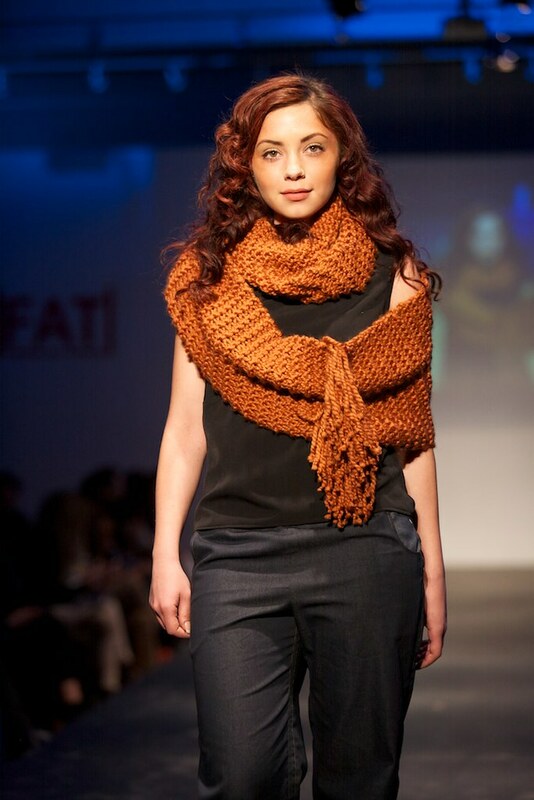 The collection saw the creative use of cowl knit scarves draped in a variety of ways. The Make Den showed a cute line that appeared to be vintage and feminine with loose lace, bow tie necklaces, and fringed shirts. During the final walk, all models held onto a long piece of fabric from the first model's skirt. The skirt was then tailored on the spot by the designer into a short wrapped skirt. ica watermelon by Julia Knupfer showed in the last set instead of the second. Her collection wowed with intricate knits and crocheting. The bottoms included the same kind of weaves with simple designs over pants that resembled loose fishnets. One model wore a "We are greenagers" t-shirt, which is the same saying seen on ica watermelon's site. 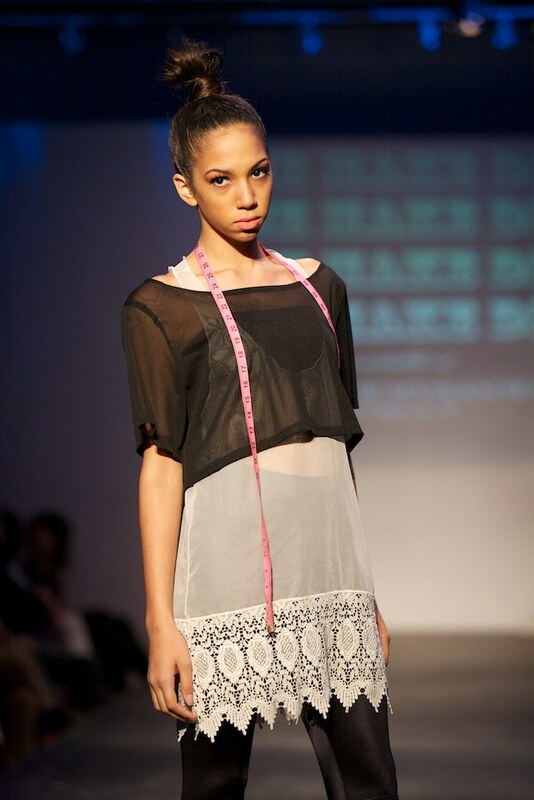 Mackenzie Jones kept the audience captivated with a narrative performance between pairs of models. 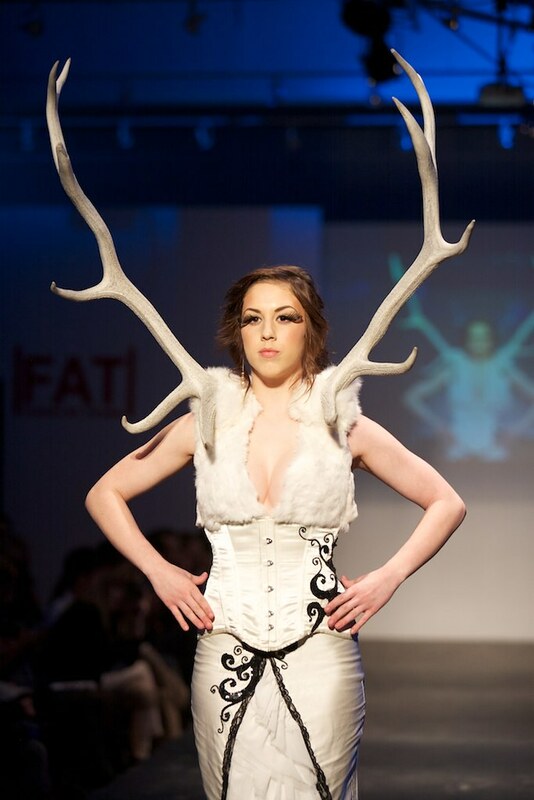 The collection appeared mythological as models wore fur, flowing dresses, and oversized horns and antlers. This seductive muted conversation complemented the styles beautifully. 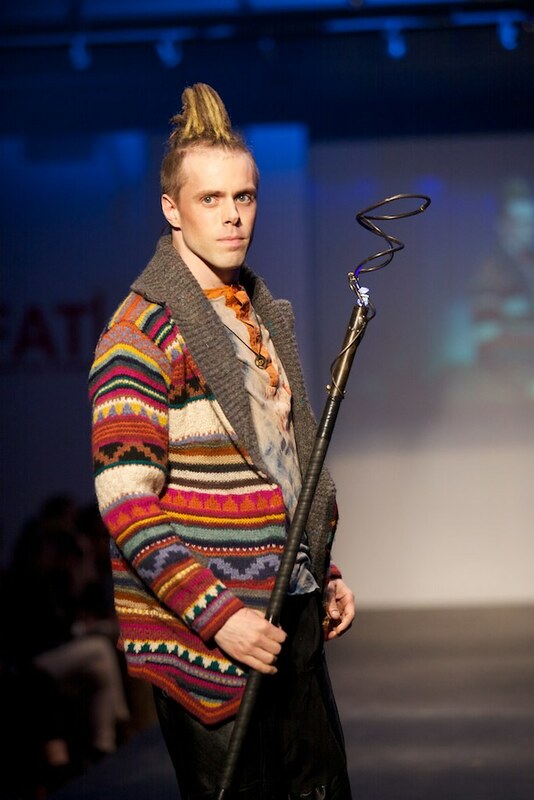 The Ryerson School of Fashion was the next to show. 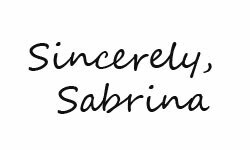 This mix of talents included one-piece jumpsuits with cutout backs and fronts (not at the same time), a ruffled skirt, pointed shoulders, two-toned leggings, and a floor-sweeping layered dress. Little White Dress was next on the runway. As the name says, the collection featured white dresses of different varieties. Some of the dresses were fashion in flowing materials, doily hems, lace trims, and ribbon waists. The final collection of the night was by Aleksandra Bibic who had dancers in silky materials prancing between models. The dresses used pale pinks and cremes on dresses that accented the bust and waist very nicely. In between shows, I also had the chance to chat with David C. Wigley (of Worth), so stay tuned for that interview! The image of the lady in the dress with the horns coming out from the shoulders is amaaaaaazing!